K and I recently tried out Cote, a hip new Korean BBQ place that has been difficult to get a reservation at since they received a Michelin star. We booked four weekends ahead to get something that wasn't 11:00 PM or later! The concept is part fancy steakhouse, with dry-aged beef cooked and served Korean BBQ-style. We enjoyed it, though we may prefer the experience of more traditional Korean BBQ instead (in Manhattan, I recommend Kang Ho Dong, though they don't take reservations and waits can be long). Pictured above is the "egg souffle", a steamed egg dish that comes free with the "Butcher's Feast" set menu. 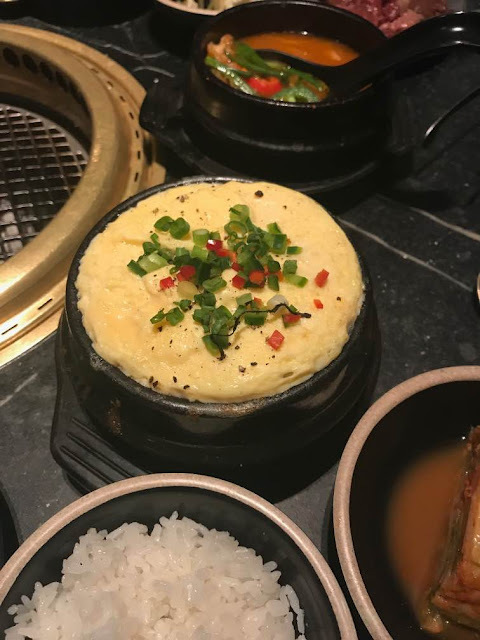 It's hardly the star of the show, but I'm very fond of steamed eggs, which are also a Chinese comfort food. 1. // I'll bet I'm preaching to the choir, but relatively few things simultaneously confuse and horrify me more than people who disrespect and completely dismiss the contributions of their stay at home partner, particularly after there are children. This is one of those things that I have, luckily, never encountered in real life, just in online spaces, but I've seen so many different flavors of it. I detest this behavior equally whether it is directed at a woman (discussion referenced here or the idea of "Jeff" here and anyone who defends him, though they may all be trolls) or a man (Corporette readers were being hyper-weird, and I was floored). I can't even begin to wrap my head around how people get into these mindsets. Anyone who seriously holds that view is being remarkably blind about some things. Granted, if the "Jeff" or Corporette situations are real, the actual problems are probably much deeper than whether the other partner has a job. 2. // I don't always agree with everything Racked publishes about workplace dress codes, but they recently posted two interesting pieces. First was one about the complicated and sometimes arbitrary-seeming rules for Capitol Hill staffers. Second, and this made me very sad, there was a piece about the dramatically awful dress code double standards that face some women of color in conservative workplaces, when compared with what other women face (which is already not great). I really would hope that lawyers would know better. P.S. the author of the second piece also wrote something I've often wanted to share, but never manage to because I disagree so much with her ultimate thesis. Her description of the bits of snide competitiveness among her law school classmates during on-campus recruiting was so spot-on, except that it's a gender-neutral behavior. I've seen it so often, throughout all stages of law school, from men and women alike. 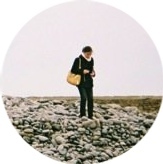 Congratulations to Sophie on her first blogiversary! Like her, I also feel so lucky to be able to connect and engage with so many smart, interesting people through blogs, and I'm so thankful and appreciative to everyone who reads here. My personal tea-making set-up is a bit different from Archana's, and I enjoyed reading about her approach. More tea for everyone! JENKR has a lovely home, and I've also been reading along about Talia's shower renovation. K and I will be perpetual renters for quite some time yet, so it's always interesting to see what other people do with their living spaces. 4. // I'm repeating myself, but I'm still shocked at how limited the work-appropriate dress selection at Loft has become. It used to be an office-wear mainstay for me, back in 2014 when I built the backbone of my work wardrobe, mostly with a few shift dresses with flared out skirts (like these, though it's a silhouette I now find a bit juvenile in theory, though I'll keep wearing mine until they wear out) that were easy to find in their "extra 40% off sale" section. 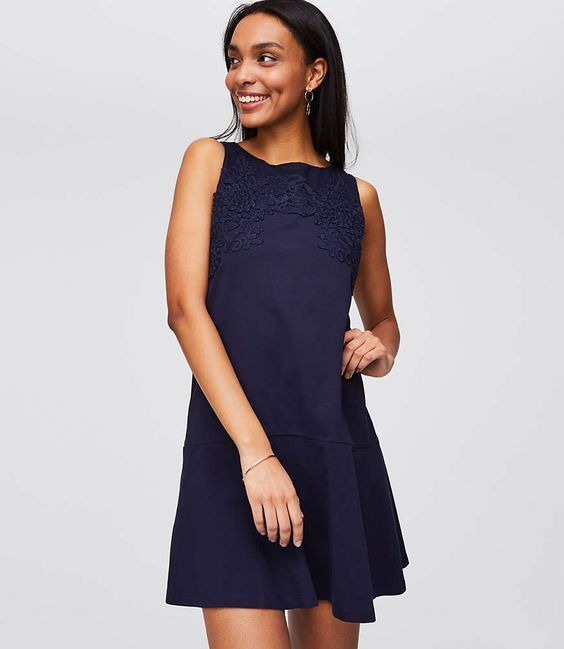 In my head, I used to refer to them as a "Forever 21 for working women" at business casual offices, and I actually meant that as a high compliment, in the sense that the ability to build a full work wardrobe quickly at an entry-level or intern price was ultimately a good and necessary thing for me back then and well, even Forever 21 items never actually wore out that quickly for me when I took good care of them. Right now though, they have absolutely nothing in their dress section that I would wear to the office, and only two things I'd consider possibilities were it not for some flaw. 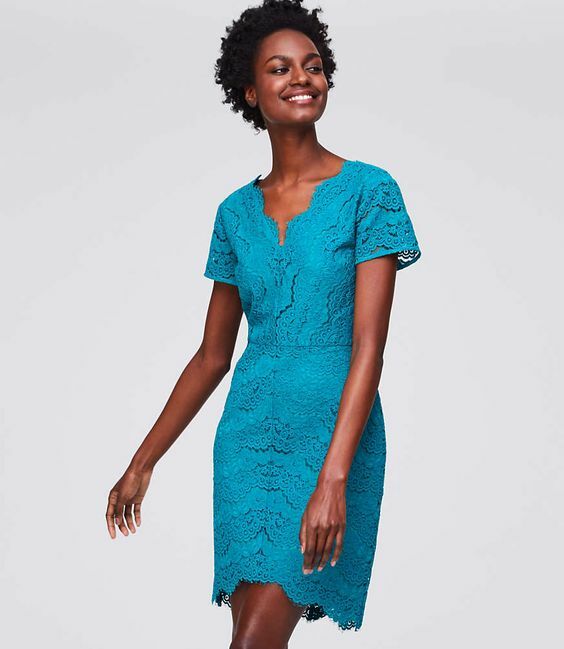 This teal floral lace dress is a bit too bright to be an office staple, though the material seems similar to my navy blue Ann Taylor lace shift dresses (long discontinued), which I like for both the office and for attending weddings. This navy "flippy dress" with a bit of lace might be subdued enough for work, but I don't like drop waists and the lace might be the kind of trendy detail that ends up looking dated too soon. Everything else they have is too casual, and is mostly unstructured, unlined polyester dresses of a type that has never looked good on me.